Travel and dating in Dnipro Ukraine with beautiful Ukrainian women. The city of Dnipro (Dnepropetrovsk or Dniepr) is located in the center of Ukraine with a population of one million inhabitants. 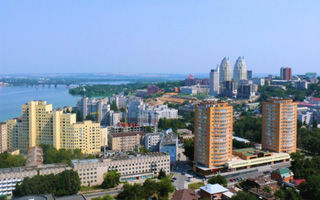 Its metropolitan area is the third largest in the country with over 1.4 million inhabitants.T his is one of the most beautiful cities in the country, crossed from north to south by the great and mighty river Dnieper with multiple forested hills, long boulevards and spacious parks. It is also a recognized seaside resort with an active commercial life and numerous forms of entertainment. 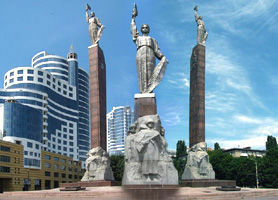 Due to its rich history, the city has a wide variety of historical places to visit. The old city was built in the middle of the sixteenth century. The new city was founded in 1776 by Prince Potemkin by order of Russian Empress Catherine II of the Russian Empire and was called Yekaterinoslav from 1776-1926. Dnipro was the mainstay of the metal industry in Ukraine from the early 20th century to the present day, and has also been a leader in the construction of machines used in aerospace design since the 50s. Dnipro Airport, located 15 km south east of the city center, offers direct flights to and from Vienna (Austria), Istanbul (Turkey), Tel Aviv (Israel), Moscow (Russia) and of course, Kiev (capital of Ukraine) etc... 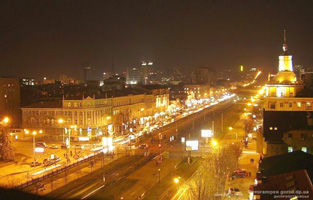 The city also has an extensive network of railways that daily connect many cities in Eastern Europe throughout the year. You can admire the beauty of Dnipro and visit all year either in spring (with a pleasant temperature and beautiful nature), summer (it's hot, many flowers adorn Dnipro and you can enjoy the lovely beaches of the city), fall (especially in September and October: trees parks and walkways boast stunning yellow, brown and red foliage) or winter (the town is covered with a beautiful blanket of snow, the temperature being about -3 degrees). It often rains in November, the other months of the year are often dry with a few thunderstorms in the summer. The main avenue of the city called Karl Marx is really beautiful: it crosses the city from east to west; it was created in the 18th century and buildings (over 150 years old) bordering this avenue are the real decoration of Dnipro. This avenue also has many shops, cafes, gourmet restaurants, fast food, clubs etc. 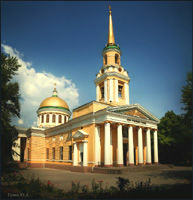 The heart of Dnipro is the Zhovtneva square where you can find the Cathedral of the Transfiguration of the Saviour built in the early 19th century by order of Catherine II. The Cathedral was built by the best architects: it has great value not only as a historical monument, but also as a true work of art. In Zhovtneva square there are many other historical buildings: the Historical Museum and Museum of seniority, the Diorama "Battle of the Dnieper River" etc ... Dnipro has many operas, theaters, museums open all year round. 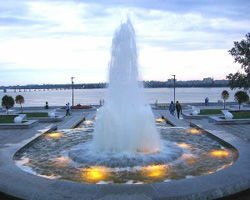 The Dnieper River is a beautiful creation of nature and helps keep a temperate climate and fresh air in the city. In summer there are many cafes and restaurants open all along the river where you can visit and enjoy the scenery. 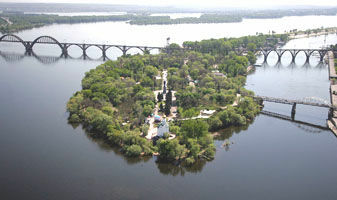 Walking along the Dnieper you reach the large park T.Shevchenko and you will discover the Monastyrskiy Island that is one of the main attractions of the city. Several centuries age the Byzantines erected a beautiful monastery on this island. 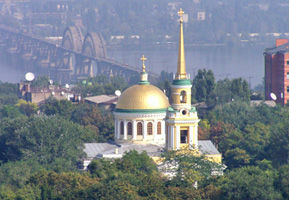 On any of the seven hills dotting the city you can see magnificent panoramas of Dnieper river, islands, parks etc. The Dnipro partner agency I work with is known for its reliability. Our collaboration began in the early days of Inter-Marriage and has formed numerous happy couples and families! I personally know the Director of this partner agency: she is a great professional who loves her job, is very understanding and always listens to her customers. Once a member of Inter-Marriage (see our terms here), if you want to go to Dnipro, I take care of organizing your trip with my partner agency so that you can directly meet the beautiful Ukrainian women looking for the right man and for a sincere and lasting union. Click here to view the profiles of Dnipro women. Driver to welcome you at the airport upon arrival at the Dnepropetrovsk (Dnipro) airport + bring you to the airport upon departure (80 Euros). During your stay you have an English speaking interpreter guide (upon request) (16 Euros / hour). Ongoing support from the director of our partner agency (booking of the hotel or apartment, general organization of your stay locally): 50 Euros. Airline tickets, food and the outputs are your responsibility. So make the right choice, make the INTER-MARRIAGE choice: click here to start your new life.